Grill some hamburgers, butter some corn, …load some muskets? warm up your singing voice? A brief look and page turn at your calendar will point out that next week is Independence Day. 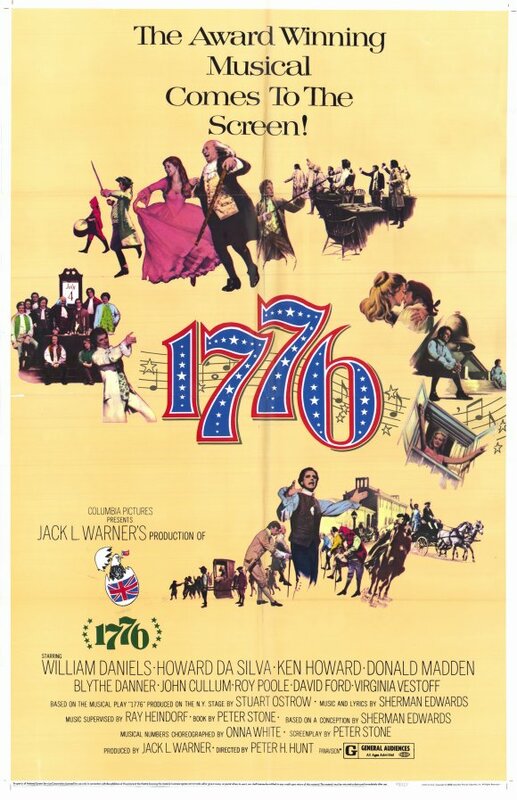 And what better movie to mark the event with than 1776? Okay, there are better choices, but I’d seen most of the ones that came to mind and/or couldn’t get them on short notice. I can see the potential for the War for Independence to be a musical epic, but no individual major events really suggest songs to me. The writing and signing of the Declaration will probably have centerpiece song(s), but beyond that, I have no idea. A year into the war against England, John Adams is fed up with the Continental Congress’s refusal to countenance his proposal of independency, and they’re fed up with him. Seemingly his only ally is Ben Franklin. But Franklin proposes letting someone less infamous raise the proposal, and enlists Richard Henry Lee to get permission from Virginia to propose it. Finally having a foot in the door, Adams and Franklin then set about to do whatever necessary to assure the passage of the resolution, which due to the unusual nature, must be passed unanimously, over John Dickinson’s strong Loyalist opposition. For such a long musical, there’s relatively few songs. As usual, the more irrelevant they are, the more interminable they are, but there are long stretches of the movie where I found myself wondering, “shouldn’t there have been a song or two by now?” The majority of the runtime is spoken debate in Congress, which while enjoyable in itself, would have made a few good shouting match songs. Of course, several songs come out of the debate, but only one-sided ones. Where this movie really shines is the wit of the verbal sparring. The entire tone of the movie is set by Adams’s line as he returns to the floor, “one useless man is a disgrace, two are called a law firm, and three or more become a congress!” Several of the memorable moments are from Franklin, but he far from steals the show. The humor is spread almost as equally as the focus. The more screen time a character gets, the more witty lines he gets, more or less. The historical inaccuracy (mainly the protracted monthlong fight vs. the historical approval of the measure on July 2 and ratification of the Declaration on the 4th) didn’t bother me as much as the transitions between days. Very often, the change of days is signaled by the Congressional Custodian coming through in the middle of a discussion and changing the calendar page as the debate goes on unbroken around him, with a fade to a scene with different lighting and/or outside weather to show that it really is a different day. I understand the use of these dramatic tools to summarize the discussion while progressing through the time frame, but it would make much more logical sense to do one or the other. If using distinctive lighting, why would he change the page in the middle of a day? If using the calendar pages, why further separate them with other visual cues? This seems like a place that the stage and the screen did not mix effectively. I also had some logical questions about how the discussions between John and Abigail translated from letters to the shown conversation, but that was easier to just go with. Watch this movie: if you want to see Lincoln with the focus changed to independancy and a hint of music. Don’t watch this movie: in place of studying for a US history exam.